Today brings my stop on the blog tour for Last Seen by Lucy Clarke. 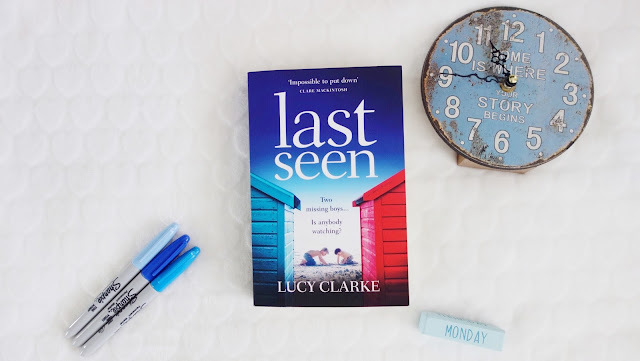 I am so excited to have Lucy on the blog as part of the tour, telling us a bit more about Last Seen and her writing process. 1. Can you tell us a little about Last Seen for my blog readers? On an idyllic sandbank dotted with beach huts, two boys disappear on the same day – but seven years apart. Their mothers, Sarah and Isla, are best friends. In their search for answers the beach community is torn apart, until the friends are forced to look more closely at one another. 2. I'm sure you get asked this a lot, but where did the idea for the story stem from? I had an image of two women standing on a shoreline, hands gripped, scanning the water for their young sons. When I tried to zoom in more closely on this image, I could tell from the clasp of the women’s hands that they were best friends, and I began to wonder what would happen if only one of their boys was brought back to shore alive. What then? Could their friendship survive? How would it shift and change over the coming years? That was my starting point. 3. Last Seen is your fourth novel, but do you have a favourite? I have different attachments to each of my novels. My debut, The Sea Sisters, was the book that launched my writing career and it was also a Richard & Judy Book Club choice, which makes it particularly special to me. However, I think Last Seen is my favourite story. I began writing it shortly after I became a mother and I feel like the emotion I felt during that period is captured in the story. 4. The sea plays a prominent part in all your novels, why is this? I’ve grown up on the south coast of England, so the sea has always been part of my life. Cities are wonderful and exciting places to be, but after a few days I feel an almost gravitational pull towards the coast. In fact, I do most of my writing from a beach hut. It’s where I have my clearest thoughts – there’s just something about the possibility of an empty horizon. I can’t say with certainty that my future novels will be set around the sea, although I’ve a feeling there’ll be at least a whisper of a sea breeze in them! 5. There are a lot of surprises and twists in Last Seen, how do you keep up? I absolutely love writing stories filled with twists and turns. I try and find a balance between planting subtle clues, while also ensuring readers are left surprised. Some twists are planned before I begin writing, but many of them come to me during the drafting process. 6. When you start writing a novel do you know how it will end? When working on a new book idea, I typically spend the first few weeks brainstorming the plot and fleshing out my characters. So yes, in theory, I will have a loose idea of how the story will end. However, the reality is that the ending usually turns out to be completely different to my original plotline. Once I’m truly immersed in the story, and begin to live and breathe my characters, they tend to direct things in ways I hadn’t imagined. The last two chapters of LAST SEEN only came to me in the final month or two of writing. 7. Can you give us a sneak peek into your writing day? My husband and I co-parent, so we split each day in half: I write from 8AM – 12.30PM, and then spend the rest of the day with our two young children. Because writing time is limited, I *try* to be very focused, so I turn off my phone and the internet and get my head down. I can write anywhere as long as I’ve got a pair of headphones and a good playlist, but my favourite writing spot is definitely the beach hut. I don’t set myself a daily word count, I just do what I can. Some days are productive and the words seem to flow. Other days – many, many other days! – are a battle of coaxing and teasing the words onto the page. Tea helps. As does chocolate. Or a blast of sea air. Great questions! I'm doing a Q&A too next week and the 4th question is the same haha but the rest are different. Thank you so much! Haha great minds think alike! I will look out for your Q&A too!